“I’m the son of Death, Nikki. There is one way to kill me, and it was not in Konstantin’s power to do. But there is no power on earth that can contain me.” He walked through the snow toward me—leaving footprints this time—and crouched so he was about at eye level. The Descendants Series is one of my new favorite Urban Fantasy Series and I just can't help but devour them. I spend the day reading this book and finishing before the day ended too! 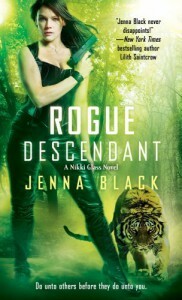 ROGUE DESCENDANT was not as good as the previous two books in this amazing series, but it was still a thrilling read. Konstantin has gone into hiding and now Anderson wants Nikki to track Konstantin so he can kill him once and for all. And to top it off someone is gunning for Nikki, hurting her in ways that has her wanting to track down Konstantin, but she suspects it may be Anderson's ex-wife, Emma behind it. I enjoyed a lot of the further character and relationship developments in ROGUE DESCENDANT immensely. We have Nikki and Anderson's relationship. I don't know what to make of it yet, but I love what I'm getting of their little relationship. Emma has been insanely jealous because she thinks something is going on between the two of them Obviously there isn't, but I would like there to be. I could see great potential there if a romantic relationship formed. 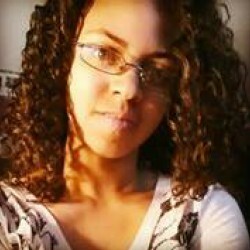 Plus I may just be madly in love with Anderson to the point that I want them together so badly. But Hot Mama! That man does crazy things to me! Maybe it's a god thing. “You deserve to have a life,” I told him, caressing the fullness of his lower lip with my thumb as I closed the last remaining distance between us. And we also have Jaamal and Nikki's relationship to discuss. It felt like things were going nowhere with them. Firstly, Jaamal has this supernatural tiger, Sita which helps to suppress his death magic. It helps him so he is in control, but Sita is jealous of Nikki, because Nikki gets most of Jaamal's attention, so things are a bit distant between them. Obviously, I didn't dig the whole tiger thing. I just didn't like it. The drop of the tiger being there just kinda felt sudden and it was like what?! huh?! But despite Sita, we still did get some smexy Jaamal and Nikki scenes, but yet again with the interuptions, but boy was it hot, so I forgive you, Jenna Black. My cheeks felt cold and bloodless, and my mouth gaped open. My mind could barely encompass what he’d just told me, and I desperately wanted to dismiss it as some kind of hyperbole. A shudder ran through me. ROGUE DESCENDANT did end up being draggy in quite a few parts and I really didn't dig the plot in this installment all too much. It really did feel like a filler book to me, that it was needed to get to the ending. And I gotta tell you, that ending was just WOW! It's nothing where it's a insane cliffhanger or anything, but it's definitely a game changer in the world of The Descendant. It's like what's going to happen now?